VirginiaHousingSearch.com, an online rental housing locator service launched in 2009 by VHDA, has been growing steadily. Earlier this year, the site reached a milestone of more than 100,000 registered units! 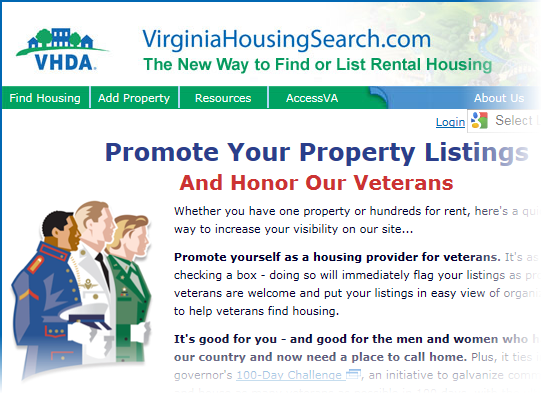 An exciting new development for VirginiaHousingSearch.com is a specialized Veterans option that helps landlords promote themselves as housing providers for veterans. This complements Virginia’s 100-Day Challenge to house veterans experiencing homelessness and makes it easier for landlords to connect with veterans and organizations that support veterans in need of housing assistance. As always, VirginiaHousingSearch.com is provided at no cost to either those looking for housing or listing a property. VHDA sponsors this service as a way to provide a comprehensive online listing of available rental properties across Virginia.